This one is the simplest ways to welcome guests for summer lunch party. A very nutritious salad of mushroom, spinach and sweet corn. Rinse the mushrooms briefly under running water and pat dry with a paper towel. Squeeze half a lemon juice over the mushrooms and keep it aside for 5 minutes. In a non stick frying pan, heat oil and add the coriander seeds. Fry for a second, then add spinach and mushrooms. Stir fry for 2 minutes and add sweet corn to it. Cover the pan and cook on a low flame for another 5 minutes. Add tomatoes, salt and pepper in the pan. Stir-fry for a minute. Turn off the heat. Transfer this to a serving dish and squeeze the remaining lemon juice. After it cools down, keep in the fridge for half an hour before serving. Slurpp, never tried mushrooms in salad, salad sounds truly fantastic n interesting..
healthy and yummy!!! looks so delicious.. Thank you Ladies for your encouraging comments. @ Treat and Trick: With Coriander seeds it tasted even better. that looks so inviting..cool clicks !I've posted a mushroom recipe today..lol..
wow!beautiful click!sounds super healthy n xllnt snaps! Thank you Deepa! Wish I could send them to you! very nice salad with mushrooms and spinach. healthy and delicious! i could have it just as is for a meal too. as I always say I can eat mushroom in any form. never tried salad though. looks lovely. between for that khayra machh enquiry...I live in Bangalore too and you can get it in any fish shop. the local name is Matti or Mathi. guess these are sardines...need to confirm though. 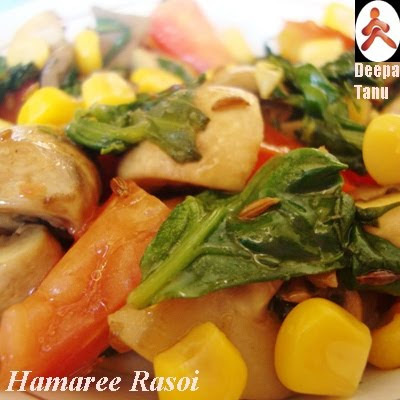 Hey deepa n tanu,iam back with full energy from india.Thanks for your comments,meant a lot to me.Mushroom salad looks so refreshing n ravishing dearies.Very much healthy as well. Never tried sald with mushroom..looks so inviting . Beautiful click salad looks delicious and colourful. Mushroom salad looks yummy and tempting. Very healthy salad. 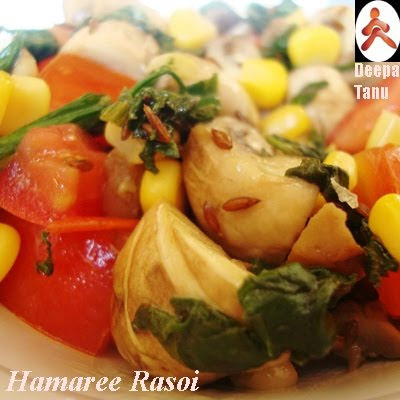 Wow, your header image is so drool worthy, and this mushroom salad is looking preety delicious..thanks for joining us. hey nsuhroom and spinach in salad, healthy and nutritious.. Salad looks tempting and yummy! wow salad is really gr8 & healthy..i will try this one.thankyou dear for the award.